Using radiator antifreeze as washer fluid is dangerous. If sprayed on the windshield, it will dirty the windshield, affect your visibility, and could result in an accident. Operating your vehicle in temperatures below 4 degrees C (40 degrees F) using washer fluid without anti-freeze protection is dangerous as it could cause impaired windshield vision and result in an accident. In cold weather, always use washer fluid with anti-freeze protection. 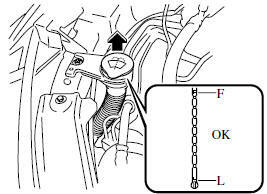 Inspect fluid level in the washer fluid reservoir; add fluid if necessary. The top of the float should be between F and L.
Use plain water if washer fluid is unavailable. But use only washer fluid in cold weather to prevent it from freezing. Front and rear washer fluid is supplied from the same reservoir.